After being disappointed by my Drobo for the third time I abandoned it and switched to another RAID system which, in contrast to the Drobo, also serves as a NAS (network attached storage, meaning the storage device can be accessed using your local network). 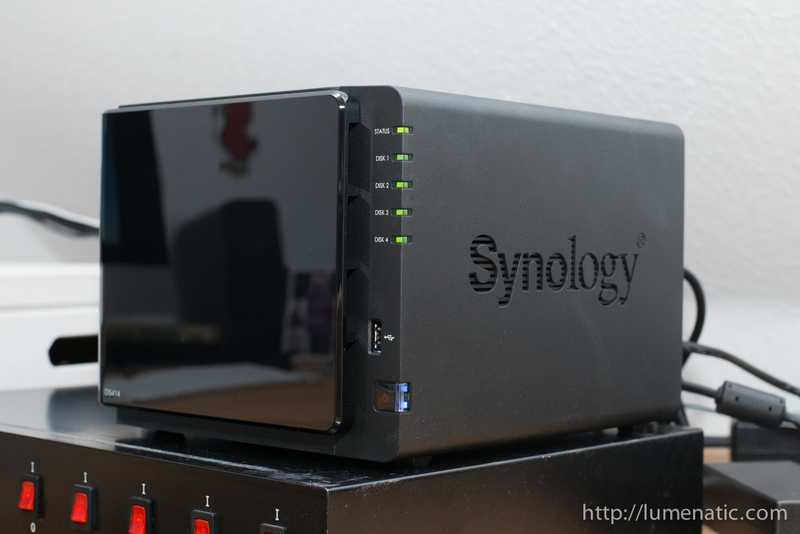 I read some reviews I decided on a Synology DS414 (be prepared to pronounce the brand name loud and clear. I encountered the following awkward situation more than once… after stating what I purchased I was looked at in horror: “You bought WHAT ? Scientology ?”). The DS414 is a 4-bay RAID system which can hold hard drives of up to 16 TB each. 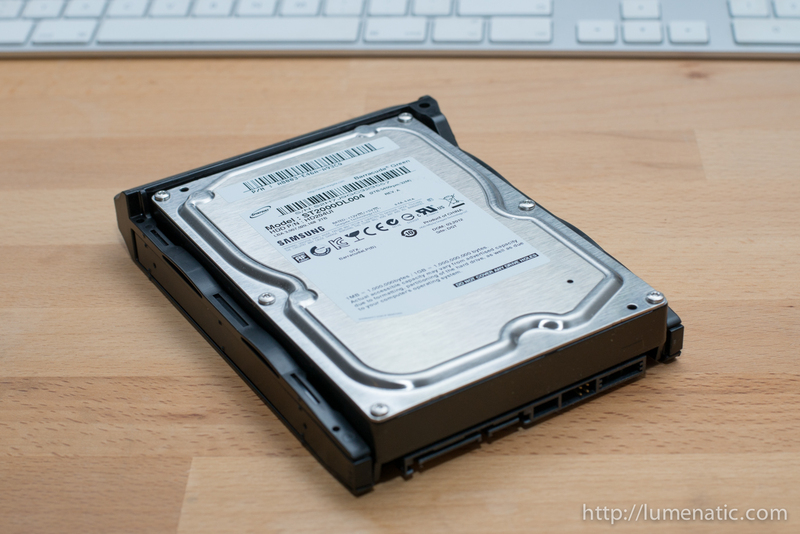 I used the drives from my Drobo, 4x 2 TB 3.5″. I chose a RAID6 system, meaning that the data is distributed in such a way that two drives can fail at the same time without losing any data. With 4×2 TB and RAID 6 you have 4 TB of total usable space. With RAID 5 you would have 6 TB of usable disk space. I chose to be consequent with my totally paranoid data storage strategy and chose the “safer” option of RAID 6. Setting up the DS414 is pretty easy. Connect power, connect LAN (the device also has two USB 3.0 ports, those can be used to connect an external HDD for rapid file transfer. 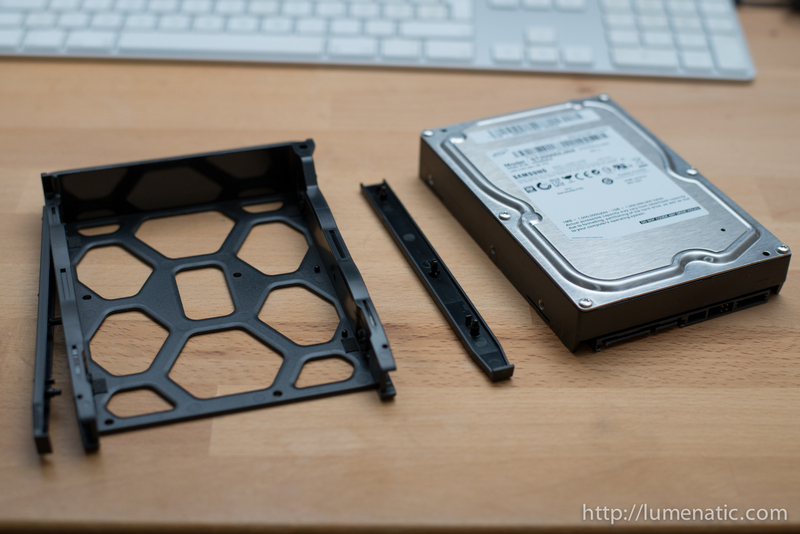 The hard drives are inserted into cradles. Two plastic stripes with rubber thingies are clipped at the side of the cradle, the rubber thingies grip the screw mounts and your HDD is firmly locked. The cradle slides into the DS414 and clicks into position, no tools necessary (you need tools of you choose to use 2.5″ HDDs though). Be informed that all drives you install will be erased upon initialization ! 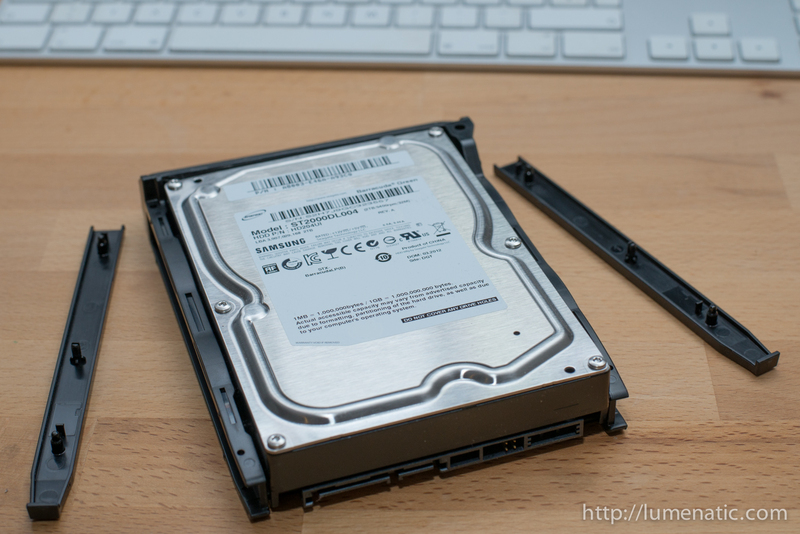 Repeat with all hard drives you wish to install, then put the lid back on. Insert the cradle back into the DS414 until you hear a click. Setting up the software is also easy, one has to say that the installation process is really user-friendly. 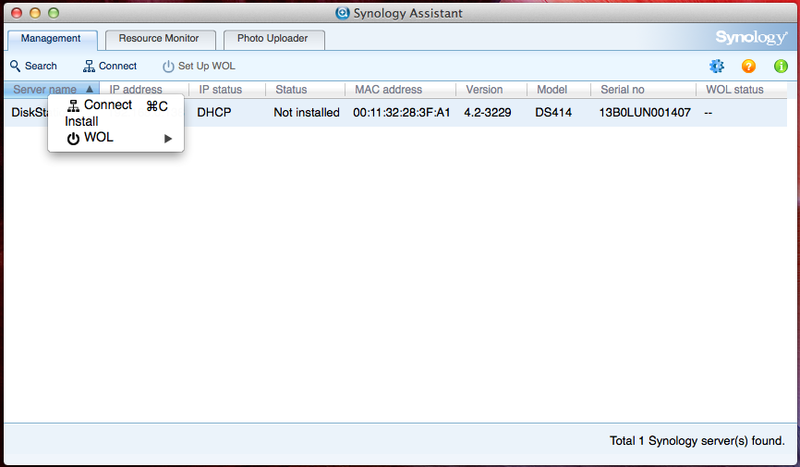 An installer (“Synology Assistant”) which comes on a CD with the DS414 (or which can be downloaded) launches the process. Then the newest software for the DS414 is downloaded and installed. The whole setup process took around 10-15 min. The DS414’s operating system is controlled using the browser of your choice. 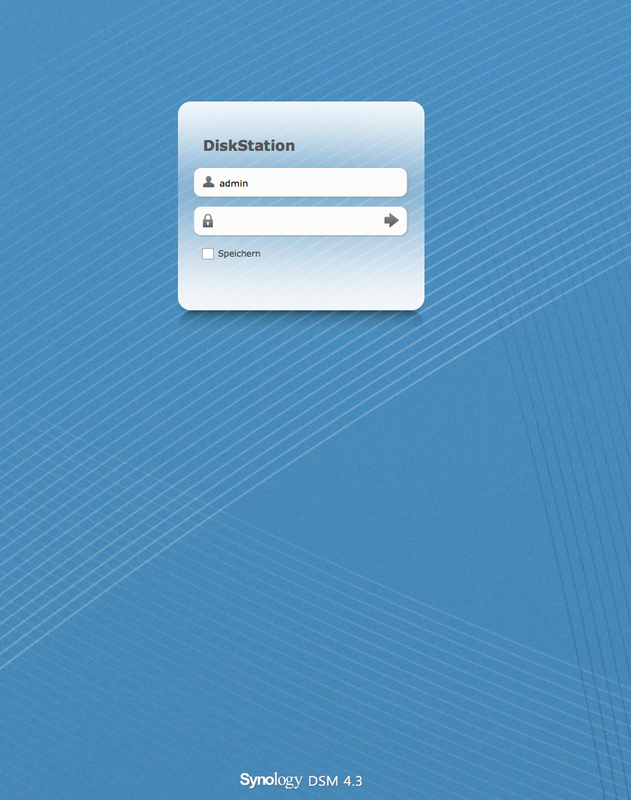 Every user in your network can access the device (if you wish so), you can also grant access to only specific users. 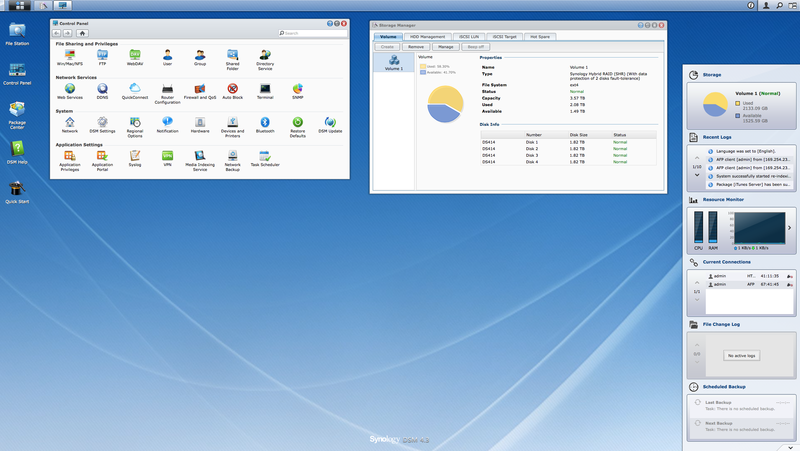 As an example, here is what I did: I created three folders on the DS414. The first one is for the time machine backup. Other users than me won’t have read or write access since the backup shall only be accessible to Time Machine. The second folder is my archive. Here other users (well, only my wife…) have read-only rights. The reason is that I want to be the only one managing the archived files to keep the structure tidy. The third folder is an exchange folder and, well, Nomen est Omen, and logically every user has read and write rights. Copying my 1,7 TB archive from one of my other archive volumes took quite a while. I used the opportunity to clear my archive of duplicate folders and sorted some folder trees into a more logical structure. Tidying up showed quite some effect ! I managed to gain around 100 GB of disk space. As I write these words a comparison tool checks if my archive on the DS414 matches one of the other copies of my archive. Once that is done the data transfer is complete and I will put the DS414 under my desk, just were the Drobo stood. One word about energy consumption. 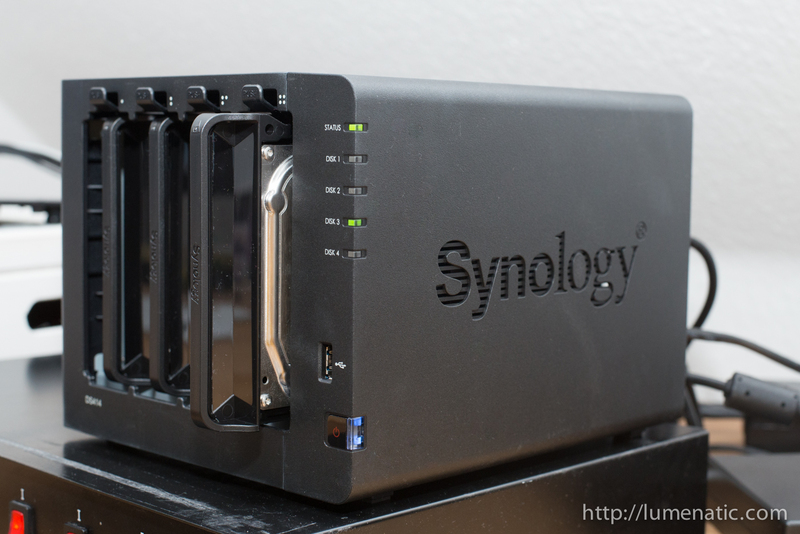 The DS414 can act as a file server, media server and whatnot. It is much much more than a storage device. But that would also mean to have the device powered up 24/7. In my personal usage scenario I use the device for archiving and backups. Hence it does not need to be powered up all day long. When active with four hard drives the DS414 draws around 40 Watts, in standby around 14 Watts. Let’s estimate I will have it switched on and active for around 20 hours a week. 20 hours * 40 Watts *52 weeks = 41.6 kWh. With a market price of around 27 ct/kWh the yearly energy cost for the DS414 would be around 11.20 €. That is acceptable. Other scenario: Device is powered up 24/7, standy 16 hours, HDD access 8 hours per day. (16 h * 14 W + 8 h * 40 W) * 365 = 198.56 kWh => 53.60 € energy cost per year. Still ok if you use the possibilities a private server offers frequently. Last aspect, and I won’t go into details here. 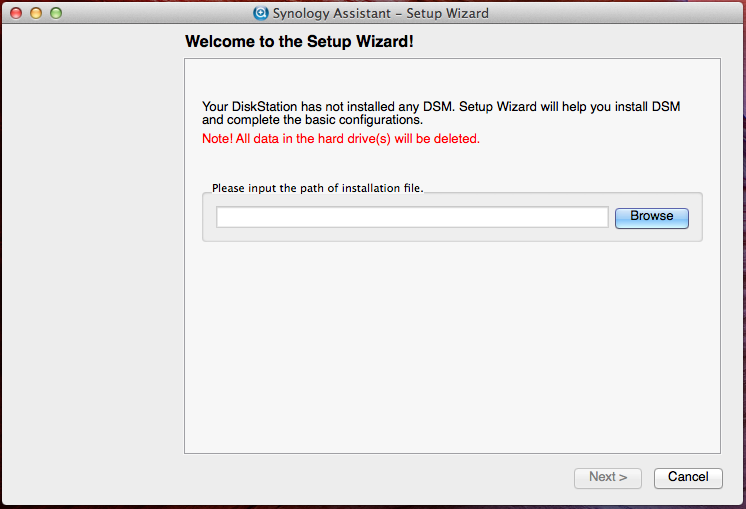 As mentioned before you can install tons and tons of software packages on the DS414. They come free of charge and can be installed quickly via the browser-based user interface of the DS414. Your own wordpress server ? No prob. A media center for your movies and photos ? You got it. 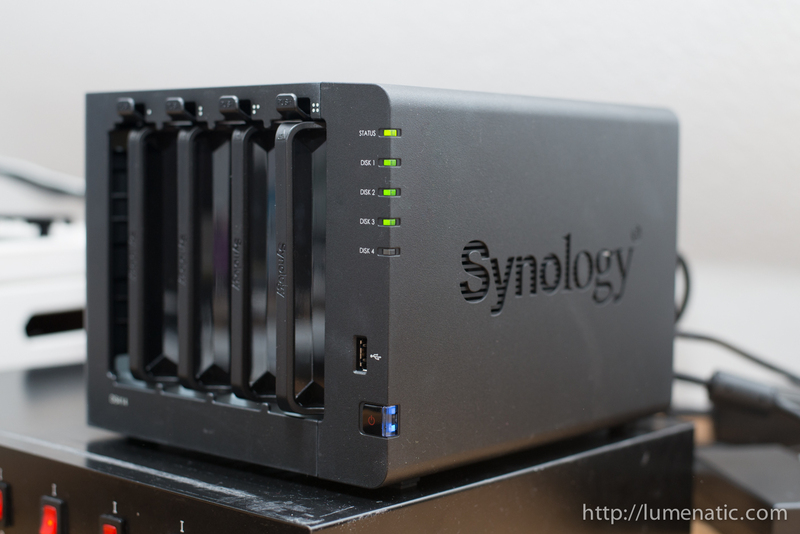 I won’t parrot all the possibilities here, just go to the Synology website and see what they offer. The only software I installed is an iTunes server, and now it gets interesting. I have a certain amount of music which is not on my iMac. That music would seldom be heard if it was on a backup device. With the iTunes media server you can bind these music files into iTunes from anywhere in your network. Sitting on the couch with your iPad ? Access the server and get the music streamed to your iPad over Wifi. That’s neat. I will start using the DS414 now and will report on my experiences after a while. Stay tuned.